This recipe for Easy Crunchy Taco Cups is the answer to your Cinco de Mayo prayers and Mexican food cravings. Fun, quick, easy to make, and delicious to boot, these versatile, kid-approved, oven-baked taco cups with wontons are made with yummy ground turkey, taco seasonings, and melty cheese. Olé! 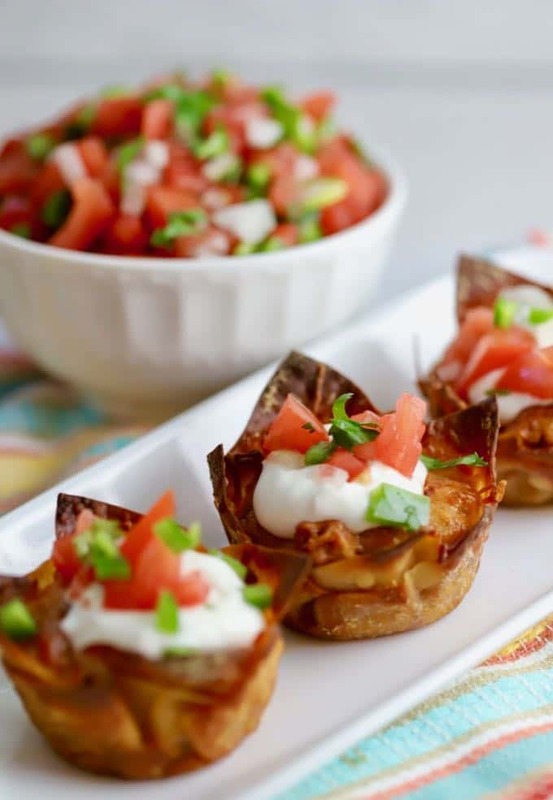 Easy Crunchy Taco Cups are made in a regular-size muffin pan, are great for “Taco Tuesday”, and can be served as an easy weeknight entrée, a quick snack, or as an appetizer for a Cinco de Mayo or Southwestern- themed party. They are so good, they will literally fly off the plate. You can also easily customize Easy Crunchy Taco Cups to your family or guests’ tastes or even set up a taco cup bar with various toppings. You could also make the taco cups in a mini-muffin pan and have bite-size mini taco cups. I topped mine with Pico de Gallo and sour cream, but the sky is the limit and anything that you find in regular tacos goes. Think tomato, mango or pineapple salsa, guacamole or cut up avocado, cheese, black olives, shredded lettuce, the list goes on and on. 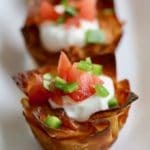 Of course, baked wonton taco cups with their crispy wonton shells instead of tortillas are not authentic Mexican tacos, but I won’t tell if you won’t, and after all, isn’t the bottom line how they taste? Speaking of taste, I made these taco cups with ground turkey instead of ground beef, which saves almost 40 calories per cup and, quite honestly, you can’t tell the difference. Feel free, however, to substitute ground beef for the turkey. 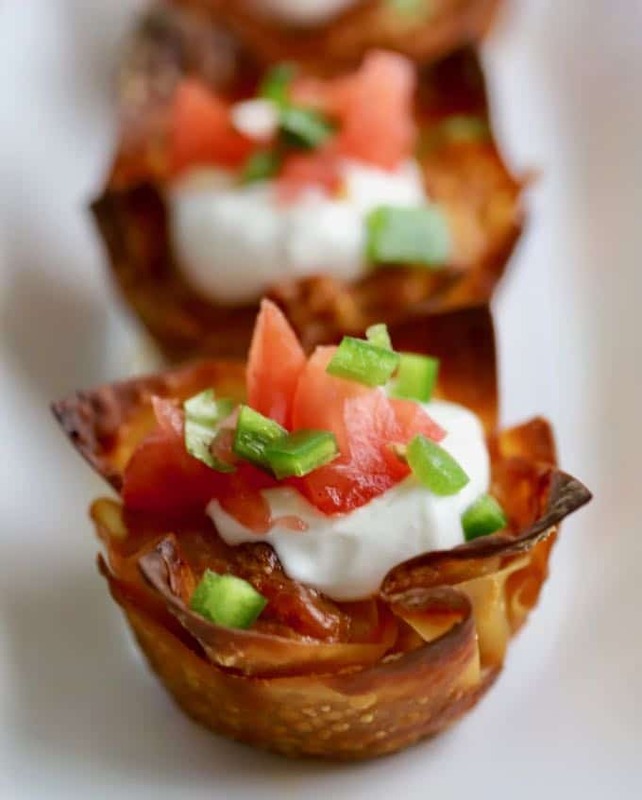 The inspiration for this recipe for Crunchy Taco Cups comes courtesy of my sister Chula and her blog, Pudge Factor. If you are like me and love southwestern or Mexican dishes or are planning a Cinco de Mayo menu, you might also like these popular recipes: Fish Tacos with Mango Salsa, Mexican Chopped Salad with Honey Lime Dressing, Jack’s Ultimate Frozen Margaritas, and this roundup of 31 Cinco de Mayo Recipes You will Love, which features recipes from my blog and from the Pudge Factor. How to make Easy Crunchy Taco Cups! 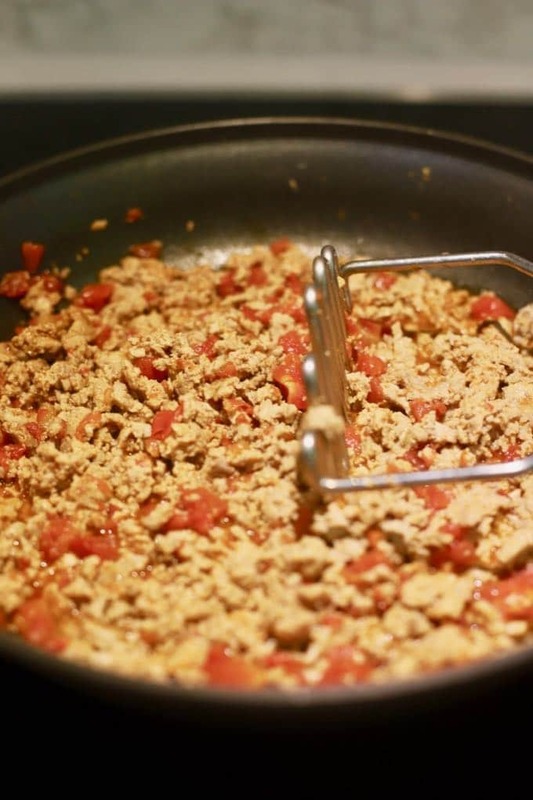 Gather your ingredients and preheat the oven to 375 degrees F.
Add the ground turkey to a large skillet over medium heat. Use a potato masher or fork to break up the meat into small pieces. Cook for about 10 minutes or until the turkey is cooked and just starting to brown. Drain any fat from the pan. Add 1/3 cup of water, the can of tomatoes and green chilies, and the package of taco seasoning mix. Mix well and continue to cook uncovered for 10 minutes or until the liquid has evaporated. Remove the skillet from the heat and set aside to cool for 10 minutes. 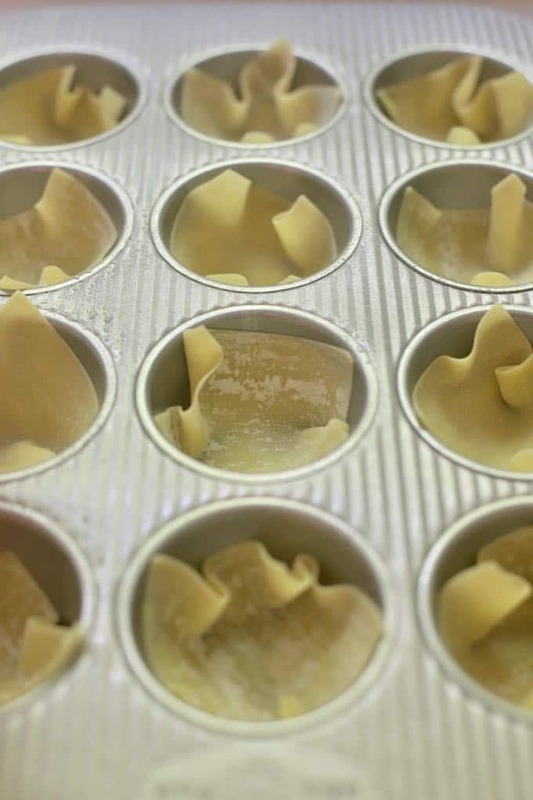 Place a wonton wrapper in each muffin cup, and gently press down into the cup. Add one tablespoon of the ground turkey mixture and one tablespoon of cheese. Top with another wonton wrapper, then another tablespoon of the ground turkey mixture and another tablespoon of cheese. Repeat this process for all muffin cups. Use a pastry brush and lightly brush the top of each taco cup with vegetable or olive oil. Bake for 12-15 minutes or until the wonton wrappers are golden brown and the cheese has melted. Remove from the oven and let cool for ten minutes. 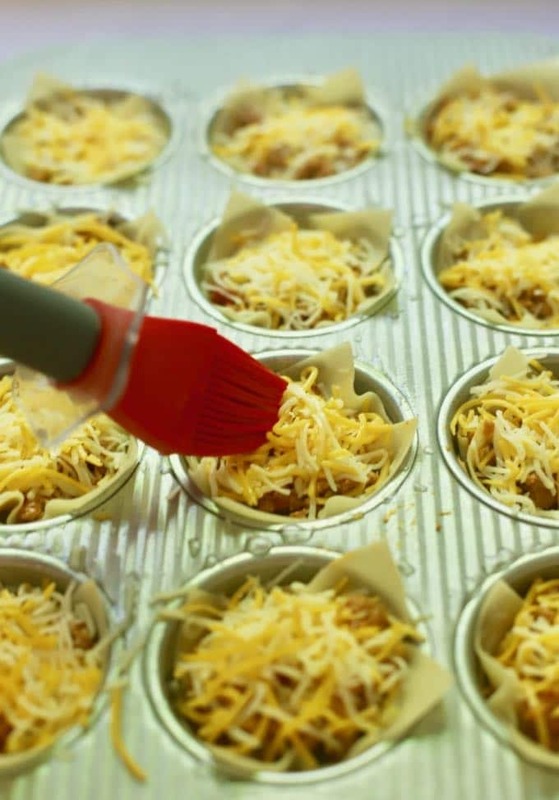 Use a fork to lift the taco cups from the muffin pan and serve immediately. Optional: garnish with sour cream, cheese, shredded lettuce, salsa, Pico de Gallo, etc. Optional sour cream, cheese, shredded lettuce, salsa, Pico de Gallo, etc. Drain any fat from the pan. Add 1/3 cup of water, the can of Rotel tomatoes and green chilies, and the package of taco seasoning mix. Mix well and continue to cook uncovered for 10 minutes or until the liquid has evaporated. Remove the skillet from the heat and set aside to cool for 10 minutes. 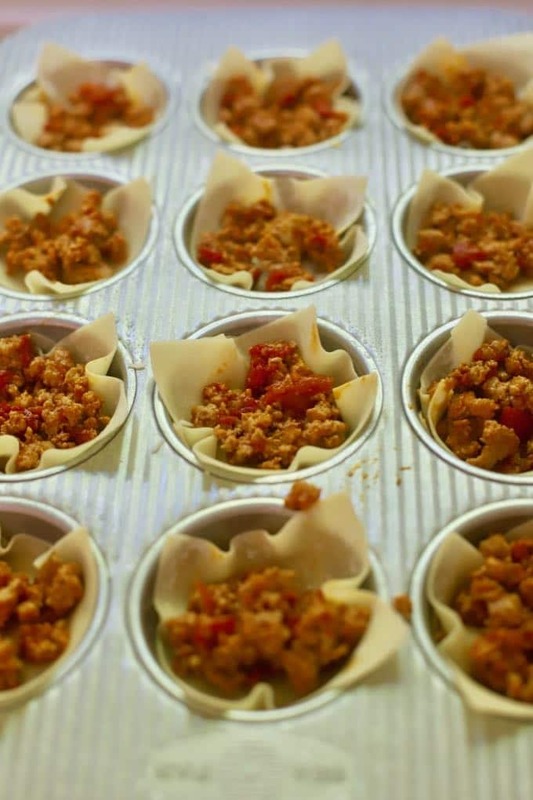 Place a wonton wrapper in each muffin cup, and gently press down into the cup. Add one tablespoon of the ground turkey mixture and one tablespoon of cheese. Top with another wonton wrapper, then another tablespoon of the ground turkey mixture and another tablespoon of cheese. Repeat this process for all muffin cups. Bake for 12-15 minutes or until the wonton wrapper are golden brown and the cheese has melted. Yum – these look amazing!